The following are testimonials from my many happy customers. I pride myself on selling good quality used cars with a professional, honest and efficient service. A ‘make it count’ experience, so love it when people get in touch. These are honest reviews and i am very proud of them. Outstanding customer service! Rachel went above and beyond to ensure I found the car that was right for my needs. Once we found the car, Rachel talked me through all the controls, made sure I knew what everything did so I could drive of the forecourt with confidence. She also ensured it had a full service and 12 months MOT with an additional 3 months warranty (for any garage). Rachel sells good honest cars at a really good price and I couldn’t be happier with my purchase. Thank you Rachel! Friendly, knowledgeable and helpful customer experience all round! Highly recommend! Fantastic cup of coffee oh and the cars all look good and at very reasonable prices... excellent customer service. Rachel is very professional and I was very happy to do business with her. Great service - Eva is so pleased with the Fiesta! Really lovely lady, really knowledgeable and so helpful, would 100% recommend, thank you!!! Such a lovely lady, listens to you and advices you with it all. Brought a lovely Peugeot and when having difficulties taxing the car she was there to help by even coming to the post office to sort it out. Cant recommend enough. Thank you. Absolutely over the moon with my car and customer service I received. Rachel was MORE than helpful answered all my questions made buying my first car a friendly and enjoyable experience. Thank you so much! I couldn’t be happy 100% recommend Rachel for anyone looking to buy a car! Brilliant. Rachel is great. Brilliant service while buying car and excellent after care. Couldn’t of got better service anywhere. Great service and Rachel is so friendly and easy to deal with. Rachel was extremely helpful and so nice to find a genuine honest car dealer. Rachel is lovely and complete petrolhead and loves to talk about cars, there's no pressure to buy she knows what she is talking about and is happy to show you around the cars if you like or just leave you to it, bought a great car from her it came with a full MOT I am very happy to recommend Rachel to anyone thinking of buying a used car. Don’t go anywhere else. We chose to buy from Rachel based on personal recommendation and it’s easy to see why she’s quickly built such a great reputation for honesty and fantastic customer service. Buy with confidence - you’ll want to recommend her to all your friends as well. Superb customer service and fabulous customer care. What Rachel doesn't know about cars isn't worth knowing anyway! Would highly recommend buying from Foakeswagon, Rachel takes all the hassle away from changing your car. Excellent, experienced, knowledgeable, honest and caring sums up Rachel and her fab company - Foakeswagons. It was an absolute pleasure to buy a car off Rachael today, she genuinely cares about what you want and need. There isn't a thing Rachael doesn't know about cars and she has put every bit of love into making her business a huge success, I believe this is down to her determination to provide each of her customers with a well priced reliable car. I would and will thoroughly recommend Rachael to anyone who is looking to buy a car. Rachel is very kind and helped me very efficently get a new car and very friendly and welcoming service! definatly recommend to friends and family! Thank you rachel you are a star. Honest, trustworthy and reliable. Rachel goes the extra mile to help you find the right car for you. I can’t rate her highly enough. Foakeswagon every time! I purchased a vehicle from Foakeswagons earlier this year. Rachel was brilliant from the initial viewing to the physical purchase. There was no sales pressure at anytime whatsoever. Rachel was also very knowledgeable about the vehicle and could answer all my questions and more. Fantastic after-sales service also. Would have no hesitation whatsoever in purchasing another vehicle from Foakeswagons. They went above and beyond to help us find the car we were looking for. It was so nice to go to a garage and be met with a friendly welcome and honest guidance. Fab and quick service, I love my newish Golf! Rachel was incredibly helpful and efficient, couldn’t ask for a better service. I will be recommending Foakeswagons to all my friends. Very helpfull and experienced.nice person and friendly. Sold me my first car, was so helpful and made sure everything was ready for me when I wanted it. Would recommend highly recommend Rachel and her service!! 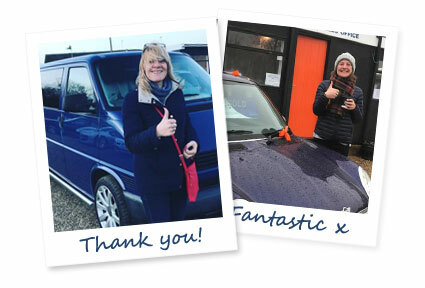 My experience & long friendship with Rach is that she will sell you the right car for your budget & give you top class customer experience, well done Rach! I bought a Volkeswagen Golf GTi Turbo MK!V from Rachel in January 2018 on her 7th day of trading. The customer service was excellent, she went above and beyond what you would expect from a small independent company selling used cars and would recommend to anyone. The car is going strong and still runs like new! Rachel was a great help in finding the right car for me. She was very friendly and helpful and I would certainly recommend her to anyone looking for their next car. Rachel is a true gem to find. She could not do enough for us. Very friendly and fair with negotiations and really listened to what we needed out of the agreement to help us get the car we wanted. We had some extra work done on the car prior to collection and the old parts were there for us to see as proof. The car was gleaming when we picked it up and all paperwork was taken care of and in order etc. Could not recommend Foakeswagons enough - if there's a car that takes your fancy, come and speak to Rachel about it.